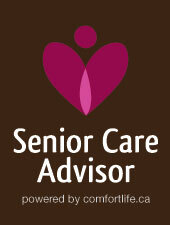 The Senior Care Advisor is designed to help you find the right type and level of health care in your retirement. The Senior Care Advisor can help you understand all the retirement options avalable to you and is designed to help you find precisely the care you need. By answering one simple question about your health the easy-to-use and interactive Senior Care Advisor will put you on the right path to retirement care that suits you, as well as providing you with excellent resources and invaluable information along the way. Remember to check out the eBooks below for more complete guides on some of the most important issues facing seniors today! Discover available retirement communities and learn about retirement living in the Comfort Life Retirement Living Guide, find out exactly what you should be looking for with the Ultimate Retirement Tour Checklist. Download one of our eBooks to revieve step by step information on selling your home, keeping healthy, handling finances and much, much more! The must-read questions you may not think to ask when you tour a retirement community.